This is one of Leonardo’s most comprehensive sheets on the propagation of light and the casting of shadows. He demonstrates that multiple images can pass through a small aperture without interfering with one another, and examines the shadows cast by a sphere illuminated by several sources. At bottom right Leonardo studies the optics of the eye: he knew that as light passes through the pupil the image must be inverted, but he assumed that the image on the retina is upright, and thus postulated that the lens must correct the orientation of the image. Small sketches at centre left show a sequence of a man striking the ground with a hammer, with the Latin heading De pictura (‘On Painting’) demonstrating that Leonardo was thinking specifically of his treatise on the theory of painting. The stooping man in red chalk is by a pupil. 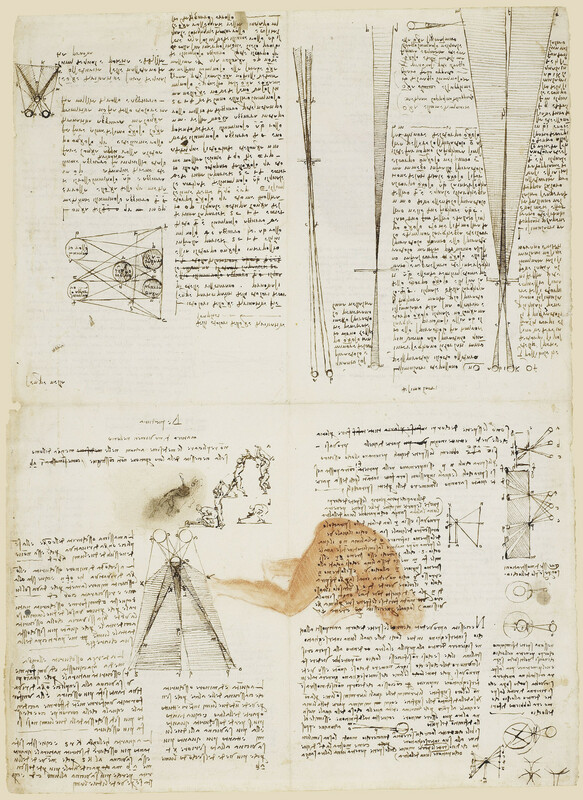 On the verso of the sheet Leonardo continues to investigate the geometry of optics. At top left and lower right he investigates the images formed when light from multiple sources passes through an aperture. At centre left he studies the optics of the eye. At lower left he considers ‘the colours of the rainbow’ seen when sunlight passes through a glass of water, and discusses the iridescent colours of birds’ feathers, of films of oil on water, and so on.